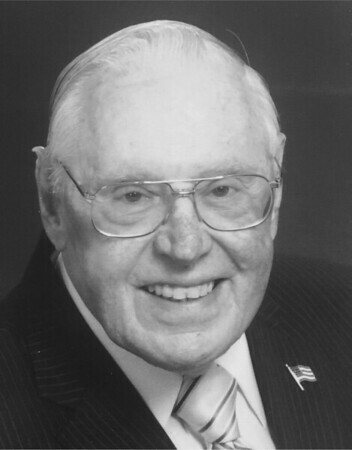 Harold Walfred Lorenson, 90, of Covenant Village of Cromwell, passed away on Feb. 3, 2019, in Cromwell. Harold was born on July 8, 1928, in Bristol, to Oscar and Edith Lorenson. He graduated from Bristol High School in 1946, and the Connecticut Engineering Institute in 1948. He married Phoebe Blomstrann on Oct. 27, 1951. Together they shared a strong Swedish-American identity, faith, and family focus. Harold’s career with Superior Electric Co. (later Dana Corp.) spanned 47 years. Working in sales, he was based in Ohio (1950-1963), the Netherlands (1963-1969, 1975-1977), and Bristol (1948-1950, 1977-1995). He established the company’s first sales office and distribution center in Europe. He traveled worldwide for his job and forged lifelong international friendships. He rose from salesman to international sales manager to vice president. Harold retired on Jan. 1, 1995. During the Korean War, he served as a radio communications instructor in the U.S. Marine Corps in San Diego. Harold volunteered throughout his life, most recently for the Benevolent Care Fund at Covenant Village. He enjoyed golfing and skiing into his 80s. Harold was known for his sense of humor, integrity, loyalty and strong faith. He is remembered for his helpfulness to others in all walks of life. Most remarkable was his dedication to his wife, Phoebe, his children, and extended family. Harold is survived by his loving wife, Phoebe Blomstrann Lorenson, to whom he had been married for over 67 years; daughters, Linda Lysaght (James), Karen Tracey (Gregory), Greta Robbins (Bob); grandchildren, Patrick Lysaght (Katherine), Andrew Lysaght, Julia Lysaght, Brendan Tracey, Colleen Tracey (Alejandro Carrasco), Erika Robbins (Micheal McElveen), and Shawn Robbins; and great-grandchildren, Katelyn, Sean, Abigail, and Nicole Lysaght. He is also survived by his brother, Edward Lorenson (Laura); his sister, Edith Judd; sisters-in-law, Wilma Lorenson, Carolyn Lorenson and Lois Blomstrann. He was predeceased by sons, Bruce and David Lorenson; brothers, Ralph (Joan), Fred and Arthur Lorenson; in-laws, Bob Judd, Rachel and Henry Carlson, Irving Blomstrann, Bob and Ruth Blomstrann. He will be greatly missed by many nieces, nephews, and friends across multiple generations. A service will be held on Friday, Feb. 8, 2019, at 11:30 a.m., at the Bethany Covenant Church, 785 Mill St., Berlin, with a reception to follow. The burial will be private. In lieu of flowers, send donations to the Benevolent Care Fund of Covenant Village of Cromwell, 52 Missionary Rd., Cromwell, CT 06416 or to Bethany Covenant Church. Share a memory of Harold with the family in the online guest book at ericksonhansen.com. Posted in The Bristol Press, on Tuesday, 5 February 2019 19:54. Updated: Tuesday, 5 February 2019 19:56.